Tag Archive | "parker school"
Parker School’s Robotics Club recently competed on the world stage at the World Robot Summit 2018 held in Tokyo, Japan on October 17-21. Parker School debate team won both sweepstakes trophies at the November 11 Punahou School Non-Qualifying Speech and Debate Tournament in Oahu. Parker School is pleased to announce that it has received a seven-year accreditation term from the Western Association of Colleges and Schools (WASC) and the Hawaii Association of Independent Schools (HAIS). 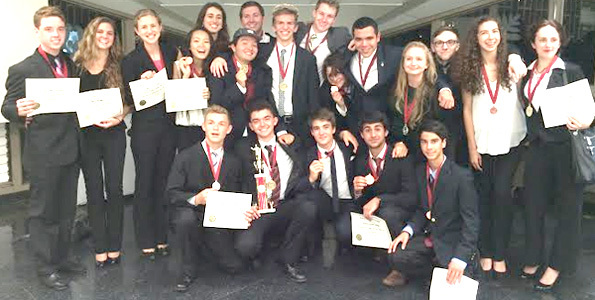 The Parker School Speech and Debate team ended another successful season with a third place finish in the debate team championships at the Hawaii Speech and Debate State Tournament on Oahu April 7-9, 2016. Parker was the only neighbor island school to compete in the state tournament held at Kamehameha Schools and Punahou on Oahu. Parker School invites the community to “run with the bulls” at the school’s 16th Annual George Heneghan Fun Run and Color Stampede on Saturday, October 17 at the school’s lower campus. The “bull” is Parker School’s mascot, a nod to the school’s paniolo and ranching roots.